Fact is, a mixed state is the most dangerous of mood states, accounting for a significant percentage of attempted and completed suicides. And, of course, rapid cycling increases the chances for trouble. First things first. I use the term “bipolarity” because I believe we’re dealing with a mood spectrum disorder. 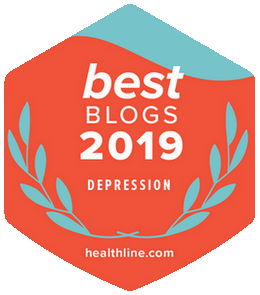 That said, traditional diagnostic lingo – Bipolar I, Bipolar II, Cyclothymic Disorder – is overly rigid, and doesn’t accurately describe what’s going-on. 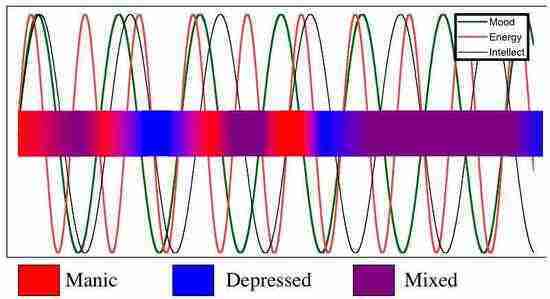 For a quick-and-easy description of mood spectrum, check-out this Chipur article on soft signs of bipolarity. All of what you’re about to read comes from Dr. Phelps. The reason I’m presenting mixed mood states and rapid cycling goes well beyond the general knowledge and learning of it all. Fact is, a mixed state is the most dangerous of mood states, accounting for a significant percentage of attempted and completed suicides. And, of course, rapid cycling increases the chances for trouble. Okay, so what is a mixed mood state? Very simply, it’s the simultaneous presentation of multiple symptoms of major depression and mania/hypomania. Is it any wonder it’s such a lethal state? Phelps supposes one would consider it all one large, confounding mess, especially when it comes to understanding. However, he assures us it doesn’t have to be – and provides tools to lend a hand. Those tools are three graphs included in an article by Dean F. MacKinnon, MD and Ronald W. Pies, MD entitled Affective instability as rapid cycling: theoretical and clinical implications for borderline personality and bipolar spectrum disorders. Well worth the read, if you have the time. Phelps grabs the term “affective instability” and runs with it. He defines it as unstable mood and energy, featuring powerful mood, energy, or creativity changes over time. Maybe it’s easy tearfulness or extreme episodes of anger over a minor event. Could even be laughing too loud or too long, or being over-the-top giddy or goofy. So why does it happen? Phelps gives the nod to MacKinnon and Pies, and he believes their perspective is significantly different from the current diagnostic protocol for bipolar disorder. See, the problem is, the diagnostic rules listed in the DSM-5 are very narrowly defined when it comes to mixed states. As we discussed earlier, a mixed state is the presentation of multiple major depression and manic/hypomanic symptoms hitting at the same time. But the rules get into specifics, such as time duration. Well, were it a perfect world, right? In fact, there are all sorts of depression, mania/hypomania combos that can present at any given moment. And the DSM simply can’t account for the variety. Pertaining to the graph above, Phelps points-out the green curve represents mood, the red is energy, and the black curve represents intellect (speed of thought, creativity, ability to connect ideas). He goes on to explain that if the curves all go up together – and far enough – we’re looking at a manic or hypomanic state. That’s at Point A in the graph. In turn, if the curves all go down together – and far enough – we’re into a major depression state. That’s shown at Point B. But we can also see how what Phelps calls “agitated depression” could be a component of bipolarity issues, as the energy curve is up while the others are down. That’s Point D.
Okay, so that’s uncommon; however, Phelps asks us to imagine what a milder version might look like. The individual would know they need to get going. Actually, they’d be thinking about multiple things they needed – really wanted – to accomplish. Still, their body would refuse to go along for the ride. So there they’d lie on the couch – miserable, yet not all that depressed, wondering what the heck was wrong, and why they couldn’t get crankin’. Finally, Phelps explains Point B, which he says psychiatrists see frequently, and is very important. As we can see, the energy wave is up, but the mood wave is down. Thing of it is, though, the timing is such that the intellect wave is up, as well – just not as high as the energy wave. Phelps calls this “dysphoric mania”: energized, as in a manic state, with very negative mood. Phelps reminds us that according to the rules, bipolar disorder is supposed to have phases (states) lasting at least four days. Actually, they’re often shorter, and they’re seen so frequently they have names of their own – as listed in the graph above. Ouch! That doesn’t fit the “official” model. 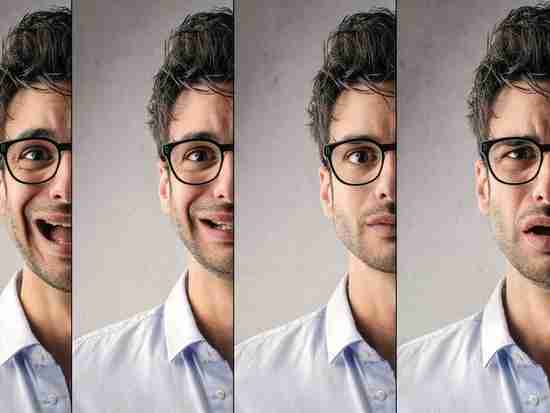 Phelps admits when the cycles get so short, and there are multiple “moods” in a day, the situation becomes hard to distinguish from “normal” emotions – say, normal reactions to events lasting a few minutes, or even close to an hour or so. When such rapid emotional shifts become extreme, Phelps says most psychiatrists begin to think about a different diagnosis. Namely, borderline personality disorder. By the way, please don’t diagnose yourself using the previous sentence. It really may not apply to you. 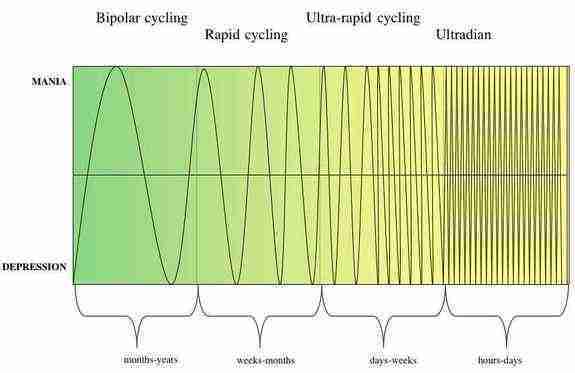 Lastly, Phelps points-out the following graph shows that a rapid cycling of symptoms, at different rates, can generate a varying pattern of nearly continuous symptoms. 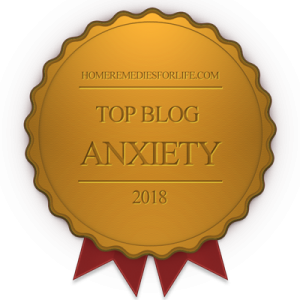 So instead of having clear episodes, the individual experiences almost constantly shifting symptom phases that actually blend into one another. Wow, right? Tons of stuff, I know. However, given the treachery of mixed mood states and rapid cycling, you have to believe it’s vitally important information. I hope you found it relevant and meaningful. Yes, bipolarity: a brutal set of circumstances for millions. And we have to do all we can to keep it in the spotlight. How else could relief ever come? Hundreds of Chipur titles are just a tap away. Please dig-in.